There are three airports around Milano. If possible use Linate, the closest to Politecnico. From Linate Airport: use bus (lines 73+91) or taxi. About 20 min. From Orio al Serio (Bergamo) Airport: ATB bus to Milano Centrale Station. Then underground to Piola, Line 2 (green). About 1 hour. From Malpensa Airport: Malpensa Express Train to Milano Cadorna Station. 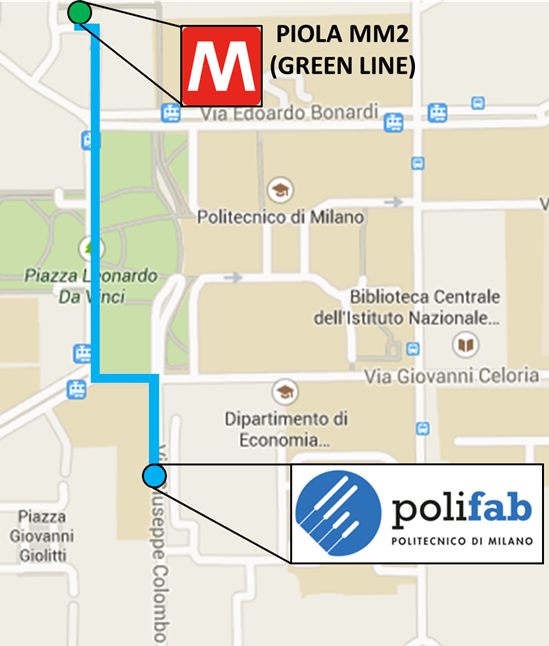 Then underground to Piola, Line 2 (green). About 1 hour. PoliFAB can be reached from Centrale Railway Station by subway. Take the Line 2 (green) of the underground in the Gobba/Gessate/Cologno direction ad drop off at Piola station, then follow the indication on the map. Estimated required time is about 15 mins.